Want to avoid the crowds rubbing rails over late-summer schools of shad? Rest your crankbaits for a spell and drag jigs for untapped bass feeding deep on sullen bluegills. Deep-dwelling bluegills will school around anything on the bottom that attracts the little living things they feed on, be that rock, brush, wood or weedlines. A Terminator® Weedless Football Jig produces well for active bass harassing bluegills near deep weediness and brush, as well as around open-water rock piles, gravel and sand flats. But if the bass get finicky, DeFoe might switch to a Terminator Finesse Jig. Black-and-blue skirt patterns imitate bluegills best, DeFoe says, but green-and-orange can be good in certain situations too. “That can look like a crawdad or a bluegill,” he explains. Terminator Finesse Jigs come in three sizes (1/8th, 3/16th and 1/4th oz.) and three bluegill-mimicking color patterns (Black/Blue/Purple, Blue/Olive and Green Pumpkin Orange). Terminator Weedless Football Jigs come in three sizes (1/2, 3/4 and 1 oz.) and two bluegill-type color patterns (Black/Blue/Purple and Green Pumpkin Orange). 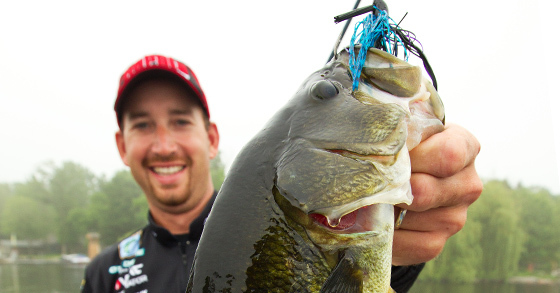 Although DeFoe concedes that in the river impoundments of the South and Southeast, 75 percent of the bass population are usually feeding on shad, he says patterns to target those fish are widely publicized and those bass get hammered by multiple tournament circuits week in and week out. This entry was posted in Terminator and tagged Finesse Jigs, Ott DeFoe, Terminator. Bookmark the permalink.